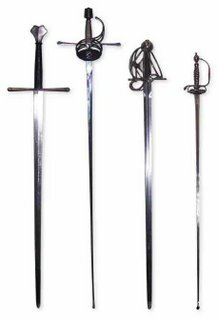 The School of European Swordsmanship, founded and run by Guy Windsor, teaches the historically accurate use of most European sword types from the period 1300 to 1900 AD, according to the principles written down by the original Masters. 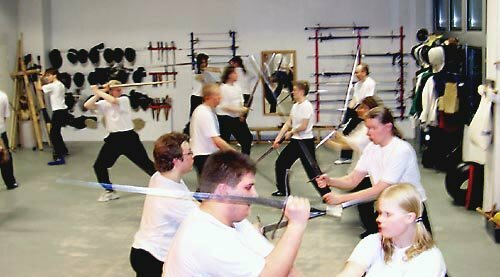 The School of European Swordsmanship, Helsinki (Finland) was founded in March 2001 by Guy Windsor. The school's first lessons took place in the Olympic Stadium and the Töölö primary school. The first demonstration lesson was attended by more than seventy people, and the first beginner's course started with more than twenty people, many of whom are still with the school. In June 2001 the school found its own salle in Jakomäki. In October 2003 the school opened two more branches, one in Turku (lead by Miika Vanhapiha) and one in Lappeenranta (lead by Mikko Hänninen). In the same year, The Swordsman's Companion was published, which lead directly to the school's association with PHEMAS of Singapore in August 2005; two hardy souls (Greg Galistan and Chris Blakey) spent a month sleeping on our concrete floor and training 6 hours per day. Since then, Guy Windsor and Provost Topi Mikkola have made the return trip and taught seminars there; further seminars in Singapore are also scheduled. In March 2006, the fifth branch of the school in Finland opened in Jyväskylä, lead by Jukka Salmi. That's a common weapon in use. 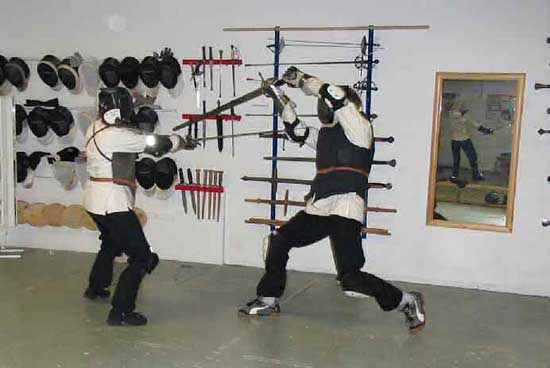 But the history of European swordsmanship is extraordinarily varied and rich. To enhance the student's appreciation of their heritage, and to expand their experience as swordsmen, many other weapons styles are taught, usually in weekend seminars. Other weapons taught include falchion, quarterstaff, warhammer, axe, dagger, and other styles of the above weapons. Students are at all times welcome to do their own researches into the treatises in the school library. Freeplay - practising in protective gear. Note also rapier practise going on in the background. 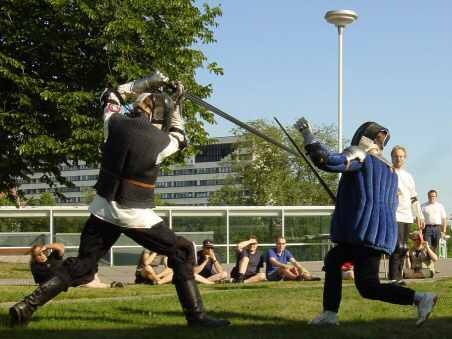 Historical Swordsmanship really differs from modern sport fencing for some reasons. Firstly, the earliest style they cover, due to the lack of available earlier texts, is from 1295. Most of what they do is from 1400-1800, so is not actually medieval, but renaissance. Secondly, they use replica weapons of the periods, and train using the same manuals that they used back then. The real difference is in the mindset. There are no interest in scoring touches, but in developing themselves as martial artists. They also cover a range of dirty tricks that would get you banned for life from competition, but may save your life in a fight. So, they are nothing like sport fencing. Equipment costs vary: the basic safety kit should cost less than 600€ in total, and can be bought in bits over time (there are drills you can do with just a mask, just a mask and jacket, etc). The first piece of kit a beginner needs is a sword, and prices range from about 300€ to 3500+ (for a gorgeous hand made highly decorated poem of a weapon). Most beginners find an appropriate weapon for about 350€. 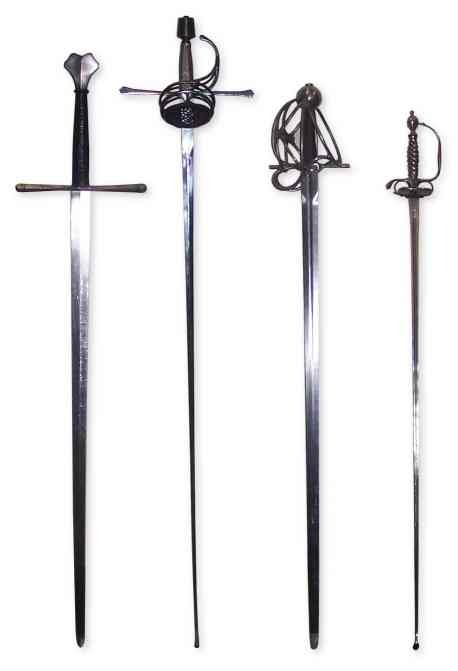 Anyone who needs to be pursuaded to buy a sword is not likely to stick with the course long enough to need one. Most students have a sword on order within about 4 months of joining. Students progress to needing safety kit in usually 3 to 9 months depending on how hard they train. A few words about Mr. 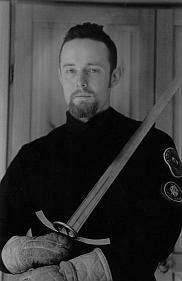 Guy Windsor, the owner of the School of European Swordsmanship. Born in Cambridge, England in 1973, Mr Windsor received his first lessons in classical fencing at the age of nine from his grandfather, Hector Apergis. In the 1920s Dr Apergis fenced with Leon Paul, himself a student of the great Afred Hutton. Mr Windsor took up karate in 1985 and sport fencing at school in 1986, specialising in the foil for four years before adding the sabre. Becoming disillusioned with the sporting approach, he began his studies in T'ai Chi Chuan, Okinawan Kobudo and Aikido in 1992. During his first year at Edinburgh University, Mr Windsor met Paul Macdonald and together they decided to form the Dawn Duellists Society. Mr Windsor first came to Helsinki, Finland, on a student exchange in 1994-1995. 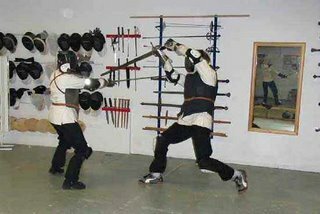 After returning home, Mr Windsor taught fencing at the DDS until, in September 2000, he decided to teach swordsmanship full-time. In March 2001, he opened The School of European Swordsmanship in Helsinki. Mr Windsor has worked his way backwards through the history of fencing, specialising at first in the smallsword with a particular fondness for the work of Donald McBane. His rapier method is currently an interpretation of Capo Ferro's treatise of 1610. 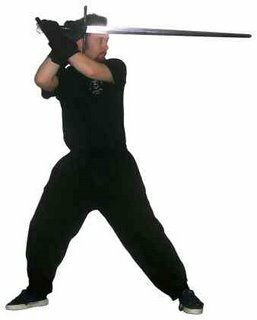 His longsword method forms the basic training of all new students, and is largely based on Fiore dei Liberi's treatise of 1410, though Vadi's of 1482-5 is also influential. The sword and buckler method in I.33 (ca. 1300) is the latest addition to the SESH curriculum. Mr Windsor also particularly enjoys practice with spadroon, dagger, spada da lato and cavalry sabre. The emphasis in all his training is on the martial effectiveness and historical accuracy of the techniques. For many years Mr Windsor has been particularly interested in the internal, meditative and medical aspects of swordsmanship. To this end, he incorporates massage and herbal medicine at an early stage in his students' training and his study of Western shamanic techniques forms the basis of the more advanced internal and spiritual training. Mr Windsor divides his time between his own training, teaching at his salle in Helsinki, and taking workshops across Finland and abroad. He was invited to join IMAF as an acknowledged instructor in July 2001, and accepted in January 2002. In February 2004, he decided to leave that organisation. He is also known as a writer, his book on the longsword The Swordsmans's Companion was published by Chivalry Bookshelf in 2004, and The Duellist's Companion, on the rapier, in 2006. More information available at swordschool.com.